You might know me best from the picture above. But that's not where my story started. Who am I? We'll skip the existential pondering. I am a runner. I was sort of a freakishly good runner early on, it was a relief from awkwardness I felt in junior high and high school. But like every gift, it could be a burden. I had knee injury after knee injury. Three repairs. I ran for Colorado State. In truth only one full session. I broke my back in a car accident February of my freshman year and it was a long recovery. (My three starfish tattoos rest over the vertebrae broken.) I loved training. I loved racing. I worked hard to keep it. But my body seemed to fail me at every turn. Running became heartbreak, I lost the joy in a way. It took me years to stop trying to train at the level I once had. The 75 mile a week habit was hard to break. The thrill of racing. Like a strange addiction that there was no support group for. I took years off from aggressive training and racing, I grew into other areas of my life. I followed my heart into the world of storytelling (otherwise known as marketing). I met Sally Bergesen in 2010, I followed her into the dream factory that is Oiselle. I put my heart into everything I did there. I watched it grow from two, to five to fifteen people all believing in the transformative power of running and sport. 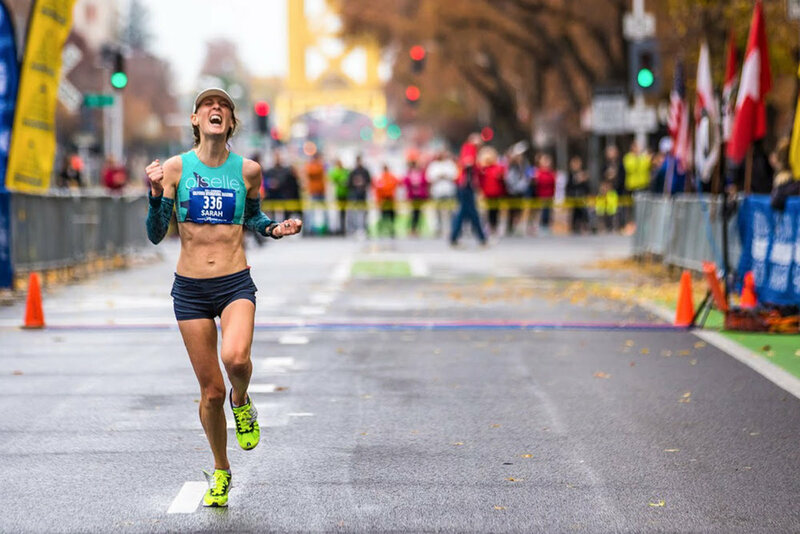 I saw our running team grow from a few women (and a lot of 'no thanks, I don't want to run for you') to signing Lauren Fleshman and Kate Grace and Kara Goucher. To having a team of Volée nearly 2k deep. Five and half years after I walked in to Oiselle and fell in love it was time to close that chapter. You can read more about this professional move here. My love for running and racing was still there, and I eased back into the sport. I had unfinished business. I wanted to run the Olympic Trials Marathon. I knew it was in me. I knew it might never happen. I chased it down in Chicago 2012, hit the wall. That wasn't supposed to be my day. And as I promised my husband I tossed my BC pill and was ready for whatever came next. On a hot sunny (I'm told) afternoon in August I met the big love of my life. Penelope Jane. Penny Jane. PJ. My whole heart wrapped up in a tiny wrinkly brand new finger. The road back to racing after PJ wasn't clear, and I wasn't sure I even wanted to come back to racing. In December of 2014 Steph Bruce took me under her wing. We never said where we going. We just took every day as it came. I didn't sleep more than 2 hours together until PJ turned 13 months. It was a very hard year. I was broken in so many ways, I was growing to fill all the cracks. It hurt. But in September I found a little secret. I ran a 'fast' half on minimal training... and I felt good. I signed up for CIM with a dream and decent training block. I ran 2:42:36. I couldn't believe my eyes when I saw the clock. I ran just 24 seconds under the qualifying time. I gave everything I had on that day, and I made it! In February 2016 I ran the Olympic Trials Marathon in LA. I burned up in the sun. But my eyes are up and focused ahead. I'm loving running and racing, I'm excited to keep training and see what else is inside. I am Sarah Mac I am 34. I am a mama. I am a runner. I am still a runner. I am a runner again. I am living my life with my whole heart.